My 300D met a deer tonight. Our insurance calls out "stated value $8000" for my 300D however..its not apparently true. So basically they charge you for a product they have no intention of delivering on. I now hove both of my Mercedes insured by Hagerty which does follow through with their agreed value policies but the only problem is they will not insure a daily driver. I would show them the eBay listings I posted earlier and go from there. It looks like your "agreed value" is pretty close to a replacement value for these cars. Thats what I would shoot for. Stated value is what the car owner claims the car is worth / insurance won't be required to pay over that. The ins then values the car at time of loss. I've been on lots of older car forums and many have been caught up in a similar situation with stated value. I just self insure for comp and pay for liability to avoid the whole mess. I went through a similar experience to all this in college, except the deer had totaled a 13 year old Honda Civic. Insurance company low-balled me, even while claiming they would "never do that". For comparisons, I needed to provide the prices of vehicles which sold within the state in the last year. They ignored asking prices, and only base their payment on actual prices in successful sales. They also ignored cars of similar year. The only data they would use was the exact same year and model of vehicle. I don't remember if they adjusted for mileage, but miles don't mean much to insurance companies on an old car. They threw out the lowest comp and highest comp, and then gave me the average of the remaining few vehicles (including my data and their own). Initially, they had offered $1600 and through my efforts, ended up getting $3300. It felt like a huge victory at the time. This was around year 2000 and in CA, so I have no idea if your insurance company will have similar requirements. Good luck. I needed to provide the prices of vehicles which sold within the state in the last year. They ignored asking prices, and only base their payment on actual prices in successful sales. I've also seen the same 98 SL500 sport for sale at $ 12 K advertized for the past 4 years with no takers. They also ignored cars of similar year. The only data they would use was the exact same year and model of vehicle. If the pool of data is large enough, they can hold to same model / year, however for a more obscure car, they will need to look at near by years trim levels but not outside of the model as doing so is looking at an entirely different car. In any event, keeping comp on a 7+ year old car isn't worth it as values plummet around year 7. Total up the cost of comp from years 8 through 13 and deduct that from your pay out. I did not think an asking price meant much. Anyone can ask anything for a car. Additionally how do you know what people paid for a car? Its easy to find cars listed on websites for X dollars but the already sold ones? The comparisons they listed in the report were largely found on Autotrader. Asking prices, as some were still active. They had 5 cars listed there, three were lower-cost 300E's and two 300D's that were at the upper end of the value list. I looked myself on Autotrader and found 6 examples. I found the ones mentioned in the compare report as well as four others that were higher priced. Had they been included and not the 300E's I believe the car value would be higher. Alright all. I am in the process of writing up an email, arguing that the car's value is much higher than $1900. I also learned that my 300D 2.5 is pretty rare. 523 units were produced between 89 and 91. I've also updated my records spreadsheet and book (receipts,etc) and plan on sending a scan of that in a later email. I have to individually scan each page. I put everything in protective plastic things and my scanner's document feeder jams up with them. Thanks for sending us the detailed breakdowns of the car's value and the repair estimate. The $1,919 value does not take take into account the over $10,000 worth of maintenance, repairs, and rebuilds that I have put into the car since purchasing it in 2012. I have receipts and documentation for all of these items. I have attached my spreadsheet that summarizes the work. I have a binder with the receipts that I will be scanning here soon. I also have receipts for the $200 CD Player and $200 professionally installed window tinting. These were valued at $30 and $20 respectively. These repairs include a complete suspension overhaul, steering system overhaul, upgrades to the electrical and charging systems, tires, brakes, wheel bearings, injector work, turbocharger work, cruise control repair, and many others. Just prior to this accident I had purchased a new set of snow tires and a set of rims as well as front brake parts. I had also purchased a number of HVAC components that were scheduled to be installed after the winter months. Beyond the above, in looking at the regional market valuation analysis, three of the five cars used to compare were gasoline powered cars. According to my research, the 300D 2.5 model had a significantly lower production volume than the gasoline powered version, making them more rare and valuable. The 300D 2.5 was a North American market model only. Figures I've seen put total 1989 to 1991 production at just over 500 units. Meanwhile gasoline powered cars were produced en mass, numbers approaching 200,000 cars. I found a few other 300D 2.5 models listed on Autotrader. A screen capture of the page is included in the attached markup for your review. I have also reviewed the $5000 repair estimate and believe that a lot of the cost can be driven down by using used parts. While the 300D 2.5 model is rare compared to its gasoline cousins it shared nearly all body parts, with the exception of the passenger side fender. I believe this repair estimate could be dropped down significantly by sourcing used parts. I checked on Car-Part.com--Used Auto Parts Market and found a number of hoods and fenders within a 100 mile radius of my zip code. They were listed in damage free conditioned and were at a fraction of the price of the genuine Mercedes parts. Additionally I plan on having a body shop quote the repair work as well. Good start on the presentation, as you mentioned, documentation to follow. I would eliminate any aspect of reducing the repair. Why would the owner of a very limited production item want to repair it using old parts ??? The $1,919 value does not take take into account the over $10,000 worth of maintenance, repairs, and rebuilds that I have put into the car since purchasing it in 2012. I have receipts and documentation for all of these items. I have attached my spreadsheet that summarizes the work. I have a binder with the receipts that I will be scanning here soon. I also have receipts for the $200 CD Player and $200 professionally installed window tinting. These were valued at $30 and $20 respectively. "" They may of may not consider past repairs, as $ X value of parts on a $ Y car does not always = the two added together. However showing past receipts does document condition of the car to support your position. ""Just prior to this accident I had purchased a new set of snow tires and a set of rims as well as front brake parts. I had also purchased a number of HVAC components that were scheduled to be installed after the winter months. "" Unless the parts were on the car at the time of loss, they won't be considered as they could be used on any car in the future. According to my research, the 300D 2.5 model had a significantly lower production volume than the gasoline powered version, making them more rare and valuable. "" Low production numbers don't always = high value, there must be a legitimate following for values to be high. RE: If you took it to a big time auction, would the price would skyrocket? While this makes valuation more difficult, selecting another diesel with the same body would be helpful. As an example of numbers / value, I have a 1956 1/2 Plymouth Belvedere 4 door _hard top_ ( no window frames around the doors ) that my Mom bought new. It is a V8 , automatic, " glamor trim " , power steering. It is also painted special order Desoto pink / white. Belvedere makes it top of the line, the Hardtop makes it rare since it was only built for sub 6 months, power steering even more rare as only 2% had PS and Desoto pink likely makes it the only Plymouth ever to be that color. To a person that collects 1956 Plymouths, it would be the holy grail, in the general 50's car market it is interesting but certainly not worth millions. I found a few other 300D 2.5 models listed on Autotrader. A screen capture of the page is included in the attached markup for your review. "" Finding others cars offered for sale does help but completed sales are what will really support your position. I have also reviewed the $5000 repair estimate and believe that a lot of the cost can be driven down by using used parts. While the 300D 2.5 model is rare compared to its gasoline cousins it shared nearly all body parts, with the exception of the passenger side fender. I believe this repair estimate could be dropped down significantly by sourcing used parts. I checked on and found a number of hoods and fenders within a 100 mile radius of my zip code. They were listed in damage free conditioned and were at a fraction of the price of the genuine Mercedes parts. Additionally I plan on having a body shop quote the repair work as well. "" This is probably your best defense for value / cost of repairs as you are showing the car can be repaired for much less than using MB sourced parts. Right. I agree, my intention was never to say that its value X+Y. More along the lines of the car is worth more because I've done a considerable mount of work on it. 321,000 miles is not representative of all the parts as by in large they are not original, and many of the wear items have been replaced. I was told to mention them. I can't see how listing them out would hurt but you are probably right. Honestly I did not even know the 300D 2.5 was a low production number car. I thought it was more common. My goal was to show that comparing the E to the D was invalid as, in the US anway, there were far more Mercedes 300E's than D's in that time frame. How would I go about finding that type of information? All the cars that he listed on the report were direct from autotrader's listing. None of them were sold yet. Some have suggested that I omit the part about lower cost repair. That I have a higher chance of getting insurance to take care of things. I have no intentions of letting them have the car or buying it off them. I don't quite understand what entitles them to the salvage value of the car considering I own it outright. If it comes to that the claim will be withdrawn and I'll work with a body shop. When an insurance co has an approved body shop, sometimes the shop writes the estimate, ins co approves repairs then if any hidden damage arrises the ins co readjusts. That is why it is called an estimate not a final invoice. When damage reaches some % of the cars value, the ins co pays you the value of the car. They are entitled to the car as, in reality, they are buying the car from you milliseconds before the loss. If you decide to retain the car, the deduct what they think they can get at a salvage auction. 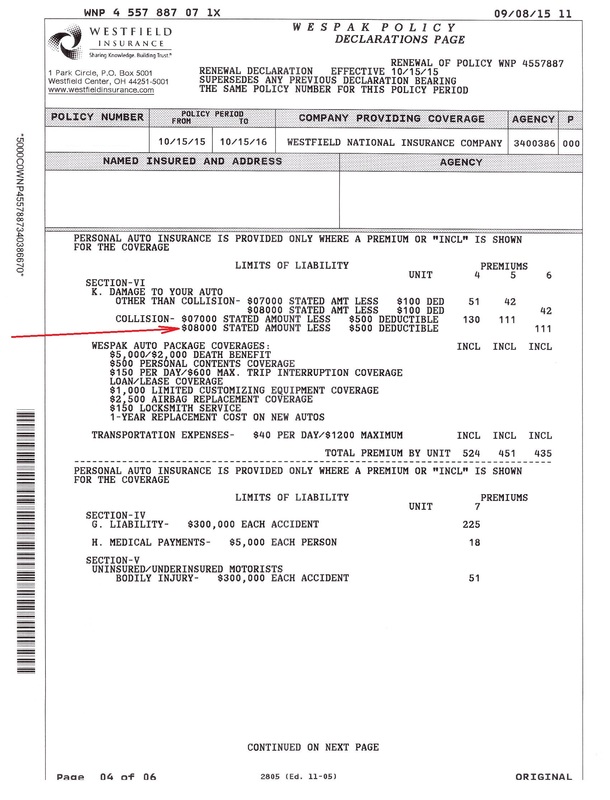 You might not be able to cancel the claim without the title being branded as a total loss, some states require the ins co to FWD VIN numbers of cars that suffered total losses. To recover from a total loss salvage title, you generally must provide receipts for all parts and get the car inspected to assure repairs are proper. The total loss based on cost not actual severity thing gets messy as I've seen an older car get "totaled" by a run away shopping cart. Really. Circa 1993 on a customers 1980 full sized Pontiac that lacked AC , was painted a odd light green with dark green interior. The cart put a pretty big dent in the quarter panel that still would have passed state safety inspection. Had this been a 5 year old car there would have been no question that the car would have been fixed. I will leave in that part then. That makes sense to me. I have a $3K quote from a body shop. I looked at their quote and was able to work it lower by using some other lower cost parts (some I had on my shelf). This puts the body shop quote down to about the same as the car value as it currently sits. The agent said we could cancel/withdraw the claim. I don't know what all that means though OR whether not he was truthful. You may be right though. The re-valued the car at $3,035 instead of $1950. We then said well by, if the repair estimate is lower than that number you have to pay for it to be fixed. They didn't quite like that at first. I had the body shop redo the quote with me sourcing some of the parts. The quote is sitting at $2400 roughly. The will pay a maximum of $2601.57 for repairs. The body shop and I have to sign a document saying that the insurance company is not responsible for anything above that amount. They will only let me carry liability insurance on the car. What do you guys think of this "deal"?